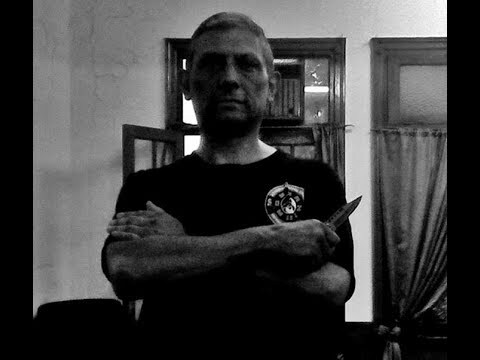 Within the project “Truth and Lie about Martial Arts” in the rubric “Free Lesson” Master Pablo Lopez has shown the System of personal extreme defense against knife attack. Today this subject is highly relevant as nobody has a guarantee that he will not be attacked by armed people or by several people at once. Moreover, most of the people do not have proper technical education in this field. Thus we consider “Free Lesson” rubrics to be highly beneficial and valuable for our subscribers. This lesson was conducted at the request of the journalist Ekaterina Sidorova. The intention of lesson – to show several examples how is possible to work in a situation when the attack is concluded on the person by of knife. According to the Master it is better to be protected during the second attack of an opponent, but not during the first, as the first attack always happens much faster. The opponent will attack at average level and quickly enough, therefore it is recommended to evade as at such speed of attack it is almost impossible to stop following actions. How to block second attack of an opponent? Hands should be kept below or above, or on each side but by no means in front. It is necessary to grab and hold an opponent by a hand that has a knife, disarm him and always pay attention to surroundings, it is quite frequent when people commit group assaults and more rarely one attacks on his own. If it is possible one has to turn an opponent with his back reversed and direct the weapon against him. If the opponent’s hand without weapon is closer to you, and the hand with a knife is farther, it can be turned back at him, having seized him by hand without weapon, then deliver strike blow from a reverse side of knees and in a cervical spine,taking opponent down and disarming. It is recommended always try going beyond zone of a review of the opponent. If it begins to move forward, then having intercepted its arm, it is possible to come for his back. Further it would be possible to break an arm or wound opponent’s hand with a knife, in case it is necessary. It is always important to deliver strikes on vital points – arteries, arms, an inguen, axillas etc. There are several options of attack that comes from behind. In such cases it is necessary to expand the field of vision first. When person is approached closely, it is not necessary to turn the corpus. It is enough to turn a neck and look over a shoulder to understand the setting of the situation. If knife is put to body of a person, it is necessary to raise hands and make a rapid turn, lowering an arm with a knife. Note, one should not forget to use peripheral sight. Let us consider the other situation. If an opponent has attacked you behind, having put a knife to the neck, in this case the main thing is to remove a knife as it is possible further from yourself. It is necessary to raise rapidly the right hand up, taking away an opponent’s hand with a knife. In such a manner person would remove a knife himself. Having intercepted an opponent’s hand with a knife in left hand and other hand in an elbow, it is possible to turn right clockwise and take him down. 1. It is necessary to shift an opponent to the opposite side. Right hand is necessary to take the opponent’s hand slightly above an elbow and to remove it to the left, holding with the left hand a hand with a knife. To sit down a little to hit the opponent with a basin, slightly straddle the legs and to lower his hand, holding by a shoulder. When you pull him on yourself through a shoulder, the opponent falls. 2. It is possible to cross palms of hands and to grab with them the opponent’s hand with a knife, at the same time to pull his hand down that he couldn’t wound the person. Then to push him by hips back, to be displaced to the right and to direct a hand with a knife against him. Further it is necessary to come behind and to strike blow from a reverse side of knees then the opponent will fall. 3. If the opponent has put a knife to a throat, being opposite to you, then it is necessary to raise hands up and to hold them flush with weapon, then to grab sharply hands of the opponent and to take them aside. At the same time the wrist of the opponent needs to be incurve in the opposite direction that the knife has dropped out of his hand. Consider the next situation. At striking a blow by a knife from below when the opponent is opposite to the person, it is necessary to jump aside a little back, to expose the left hand under his hand with a knife, and the right hand to grab his hand near an elbow and to wrap this hand aside. When the hand is wrapped, it is possible to take the opponent for an elbow, to push the left hand from below and, having pulled aside, to lay the opponent on the ground. It is also possible to be protected by expedients about what often many people do not guess. For example, a portfolio or a bag, exposing a subject under blows as a shield, and then to strike with the same portfolio blow, for example, to the person. If to accept knife blow by a portfolio from above, then, in turn, it is possible to strike kick in a groin or to throw a portfolio directly of the opponent, to wind one hand with a jacket to defend, without having wounded a hand and to strike blows with a jacket to the opponent by that part of jacket where located the lock and a lightning. He can also throw a jacket on opponent’s head, having covered the face and to strike various blows. In a situation with two opponents if there are objects around, then it is necessary to use them for protection. There are many methods of protection, depending on an angel and a way of the attack and also abilities of forwards. 1. It is possible to seize one opponent behind, holding a knife at his throat and having thrown his chin back to use him as a live shield. 2. It is possible to strike blow to one opponent around eyes – is the vital points too. Other opponent can be grabbed by a hand in which he holds a knife, and to strike with a free hand to him blow in a throat. All this occurs for fractions of a second. 3. It is also possible to strike blow in an ear or at once by two palms on ears, thereby having deafened the opponent. 4. If two persons go together and talk, and then they sharply disperse in different directions, such behavior should be considered as guarding. There is a high probability of the fact that they are going to commit an assault. In this case it is necessary to put together outstretched arms before itself and when they overtake the person, to sharply move apart hands in the parties, having struck and having pushed away them back, and then to leave. It is important to remember that if one person gets a knife, then, most likely, the second has it too. If sharply to take away a knife from one, having dumped it on the ground, then the second will probably decide not to attack. It should be noted in addition important nuances. Hands and legs have to be always in the movement to avoid wounds. If you are able to wound the opponent in a knee, then furthermore the person will weaken it, besides it will lower pressure. Striking blows by a knife can be from different angles, and here is a lot of options. It is necessary to train in this direction that the blow had in a painful point. It leads to a lethal outcome of the opponent or allows to neutralize him. Pablo Lopez has also shown an electric knife which is used for trainings. He very well feigns a real cut a knife and gives an incentive as it will not want to feel similar feelings once again to anybody. Respectively, it increases concentration, reaction and aspiration to evade. The knife works in two modes of power, and, of course, by efficiency it considerably differs from wooden or rubber knives because the person does not want that got closer to it with this knife. As a result the level of it ability to self-defense quickly grows. And finally it should be noted one more interesting way of protection with use of the ordinary pen. It is necessary to strike blow always in the vital zones, for example, sending the pen to an elbow bend, a neck, a throat, edges, a liver, an armpit, eyes, a trachea, a zone near by and near ears. The system of seven chakras also includes important zones of the person in which it is possible to strike blows too. The strong blow by ossicles of the fingers incurvated in a fist in the center of a breast can lead to a cardiac standstill or to an infarct, besides the efficiency of growing such blow increases if to do it by two fists. It is also possible to strike blows with the closed fist with one pull up arcuate finger. Such surgical strike will be much more sick. If the blow goes from above, then the direction of such blow has to be from top to down and conversely . Very important how is struck the blow in each point. For each point there is own technique; not all techniques are effective for this or that point of striking a blow. It is the best of all to strike facer with an open heel of hand because the punch can slide off. Besides, consequences of punch are more notable bones and outside whereas the blow by a heel of hand deafens so as if it was the punch. Besides, forward points of blow can be used also at the attack behind. If the person is higher than you, then he should be lowered and if below, then to lift to the level.